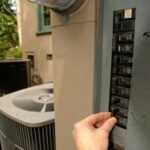 Are multiple room air conditioners causing your electricity bills to skyrocket? Or, perhaps worse, is your house virtually unlivable during summer because of the heat and/or humidity? Maybe it’s time to consider central air conditioning. Central air conditioning, also called “central air” in the United States and “air-con” in the United Kingdom, is a system that cools more than one room in a house (in most cases, the entire structure). A conventional air-conditioning system blows cooled and/or dehumidified air through ductwork to deliver it throughout the interior spaces. In most cases, it employs an air handler (blower) and ductwork of a forced-air furnace for this cool-air delivery. A home air conditioner is an appliance that will have a huge impact on your quality of life and—depending upon how carefully you select one—your utility bills. Running air conditioning can be expensive, so it pays to do your homework when choosing an AC unit. For example, it’s important to buy a unit that is large enough to cool your home but is not unnecessarily expensive or too large to operate efficiently. Cost, energy efficiency, capacity, and features are all covered in depth in the Central Air Conditioners Buying Guide. 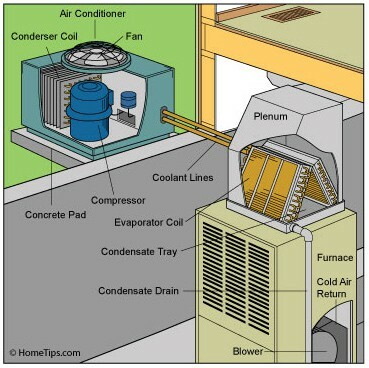 A central air conditioner cools with an outdoor compressor and condenser coil connected to a an indoor air handler (or furnace) fitted with an evaporator coil. Air conditioners use refrigeration principles to cool the air. As discussed in How a Central Air Conditioner Works, a condenser, compressor, and evaporator work together to do this job. A typical split-system air conditioner has a compressor and condenser located outdoors and an evaporator unit mounted on the air handler or furnace. 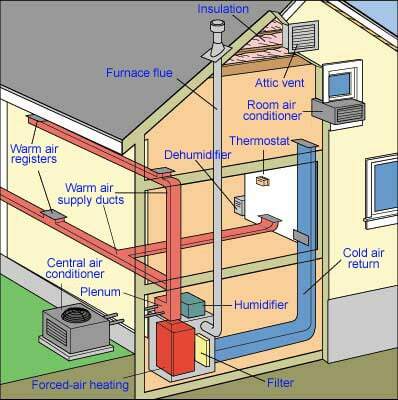 A package AC system combines all of these components in one outdoor unit. A central air unit draws room air through return-air ductwork, cools, dehumidifies, and filters it, and then blows it back into the rooms through air-supply ductwork. The AC unit is controlled by a thermostat, which turns the unit on and off as needed. If your home has a central air conditioner that is not working properly, it pays to do some troubleshooting on your own before calling a professional to fix the problem. 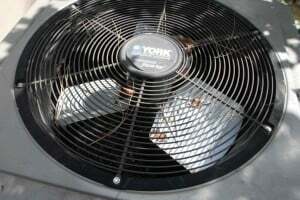 An air conditioner that doesn’t cool very well may just need a little basic maintenance. A unit that doesn’t turn on may just need to have a circuit breaker flipped. In many cases, the problem is with the thermostat, not the air conditioner. 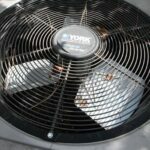 For a complete guide to troubleshooting and repairing air-conditioning problems, see Central Air Conditioner Repairs. An air conditioner’s compressor should be maintained seasonally to ensure efficiency. Almost all central air conditioners are installed by professionals—the installation is quoted along with the cost of the equipment. Be aware that retrofitting an existing home with central air conditioning may be a difficult and expensive project. Ductwork must run from the air handler to the rooms and must usually be routed through the attic or under the floor. Small, relatively easy installations typically run well over $5,000; the only realistic way to get an idea of cost is to request free estimates from local air-conditioning companies (we suggest you get three bids). If your home or your budget is not suited to this type of installation, buying one or more room air conditioners may be a better solution. For more about room air conditioners, see Air Conditioners (Window & Room).